This is a entry of two halves. Firstly, I'll be having a brief look into game licenses and what they mean for you the gamer and you, the game designer. Secondly, I'll be reviewing some smashingly good fantasy downloads from Crooked Staff Productions: dungeon building blocks, and some D&D mini adventures. When you wrangle an RPG off the world wide web onto your semiconductor driven calculating device, chances are it's going to have copyright or license information attached to it somewhere. If you've parted with dearly beloved cold cash for your Portable Document Format roleplaying game, I am willing to bet a small subset of my wife's shoe collection that it will have copyright on it. It's easy to understand for paid games: I made this. Download and print for your own use but make money from it and I'll come after you with a fire axe, bottle of cheap blended whiskey and a box of safety matches. 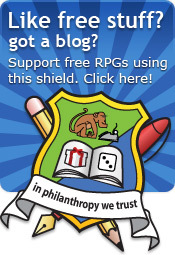 For free games, the distinction is blurred as there are more options open to the philanthropist. The options are both broad and numerous and are worth knowing especially if you intend on extending the free system for your own ends. Here are the main different types I've found in use. "It's mine. Download it and play it but the game itself is mine. All mine." Free copyrighted games work in the same way as paid-for copyrighted games. You can download them and play them to your heart's content but the copyright still remains with the original owner. You can't extend it or use any of it without the author's permission and so on. It follows the usual copyright laws. You normally find this when the game, setting or supporting material is likely to be required for something else. "Some of this is mine. You can't have that. Some of it is free. You can have that. 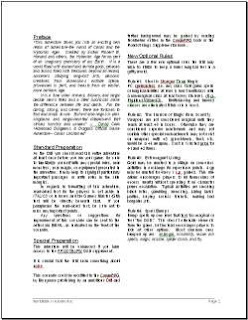 Read this document to find out..."
The Open Gaming License (OGL) allows the author to separate things they want to share and things they don't under a single license. For example, you might want the system to be open and free to modify but not any of the branding or imagery. The OGL was created by Wizards of the Coast in 2000 to allow them to separate the mechanics of their d20 system from the copyrighted D&D material. For each game, there is a standard document listing the Open Game Content (the free stuff) and Product Identity (copyrighted stuff). If you're looking to extend an existing free game, be a bit careful with OGL games because the great idea you've had for a sourcebook might breach the copyright of the Product Identity. Product Identity (PI) is actually a form of super-trademark, as opposed to copyright. That is, it allows you to protect certain terms, as well as other concepts and ideas (not normally covered by trademark or copyright). In an OGL work there are typically four types of protection: traditional copyright, OGC, trademarks and PI. "It's really free! Change it! Keep it free! Hug trees! Cycle to work! Vote Democrat! etc." These two licenses go hand in hand. The first was intended for software (dates back to 1991) and the second is newer and is used for documentation. It says that you can modify, update, copy or change the original in any way as long as you make the result free too. You can make a commercial version of it but over 100 copies, you need to make the source free. FDL licensed documents can contain 'Invariant Sections', which are things you're not allowed to change. Without that, it's the same as the GPL. Examples: Yags (GPL) and Jags (FDL). If you're not asleep by now and you're salivating at the thought of the legalities of free gaming, then check out Ricardo Gladwell's description of the different licenses over on Free Roleplay.org. Aimed mostly at Dungeons and Dragons, the free Crooked Staff Productions (Kristian Richards) has a clutch of delightful free material including maps and adventures. The dungeon maps come in colour and black and white depending on the flavour of printing. The tiles are beautifully produced and are avialable in a free downloadable PDF, which certainly makes the print a lot easier. Kristian also provides some instruction on how to get the best from the print. 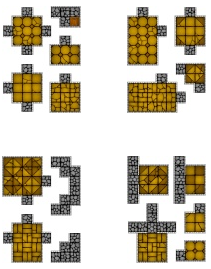 A series of foldable items for the dungeons are provided too, with doors and the like. The standard of the graphics is very high. I would imagine they would do just the job for any fantasy adventure, rather than D&D alone. Kristian also provides five D&D adventure-ettes. These are little sections of adventure that you could easily (and I mean easily) plug straight into your campaign. The titles of the adventure-ettes give themselves away: a simple lair, a typical tomb and so on. 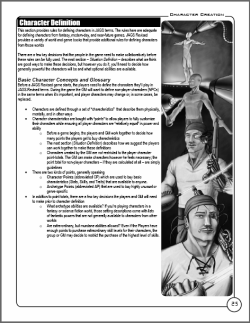 Each adventure-ette is a two column PDF with everything you need for the adventure-ette including maps and descriptions to read to the players. A crutch I know some GMs really appreciate. They are easy to read and although not massively original in content, they do their job with aplomb. They are aimed at lower levels but have a guide to levelling the encounters up. If you need some spice on the spur of the moment, these will do just the trick. A delight that I wish someone (please, don't point at me) would do for Science Fiction. Thanks for sharing, Kristian! Jags (Just Another Gaming System) is a free generic game system by Marco Chacon which is anything but just another gaming system. Jags is a professionally produced, high quality game system with excellent graphics. Like much philanthropy, Marco's vision of Jags has been supported by a cast of proof readers, editors and artists, all listed prominently on the front page. Every effort has been made to describe, explain and demonstrate every facet of the high crunch system. Marco has clearly worked incredibly hard to bring Jags about. Jags won the Best Free Game at the Indie Awards in 2006 and rightly so. The layout is professional, a strong border encloses each page with an easy to read font and a chatty writing style. Images scattered throughout are black and white and of a high quality. The game is a single column, which means line lengths are rather long in some places. Important notes, Examples, Changes and Designers notes are pulled into coloured callout boxes, which does a good job of breaking up the text. Interspersed are snippets of stories (put back in from previous version upon request) placed in non-descript settings. Page numbers, contents page and lists in alphabetical order all help in presentation and the pages are set up for a book style print with the number of facing pages moved. At 270 pages, it's a monolith if you're going to print it or beat someone to death with it. Those pages are jam packed with words, too. The core mechanic is a simple addition of 4D6, with 6s treated as 0. This is then compared against a target number, with modifiers and a concept of degree of success. The rules and examples demonstrate these mechanics so that there would be no confusion. Degree of success is well described, with examples, which is a delight. Failing by '1' often means very little but in the Jags ruleset, descriptions of what these mean are described with examples. Success Points, which are gained by roleplaying traits, can be used to assist in passing. Beyond that there are Effect Rolls and Drama rolls. Effect rolls allow a table to be used to control the outcome. Drama rolls are less obviously described but have an affect on the situation the characters are in. Combat is where the crunch really kicks in but the example is informative enought to demonstrate a complex system at work. There is nothing shocking here, rounds of 6 seconds, initiative, taking actions in turn, hitting, blocking, calculating damage type and amount and then repeat. After the example is a detailled description of combat with a mind boggling breadth of options, each with their own rule modifications. I'd imagine many GMs would skim over many of the specific rulings to keep the pace of the combat up, especially with a group of 6 noisy players. It hints at the end that a lot of the rulings are optional or advanced but it is not immediately obvious what can be dropped and what is core. A character defined by Statistics, Traits and Skills. Statistics, of which there are 12, are mental and physical facets of all characters. Traits are personal flaws or advantages to be roleplayed and skills represent a trained or natural ability. The character is created using two points systems: one for the generic character creation and one for genre-specific items (magic, cyberware etc). Character generation has all of the points I'd want to see in any system: concept of the person before statistics and so on. The stats system has a medium level of crunch as you have three types: Primary, Secondary and Figured. Primary stats act as a grouping (Physique) and secondary ones act as more specific areas (Strength). There are number of crunchy interactions between these two types with caveats attached. Further crunch is added using Stat modifiers, such as 'Powerful' that shows you are a meat mountain. Finally there are eight Figured Stats, which are derived abilities based on Primary/Secondary Stats and traits. These extra values show how fast you move and so on. The skill list (normally a dead give-away of intent in most generic systems) is biased toward the modern (or near future) setting, each skill containing its own rules, caveats and provisos. The Tools section of the rules gives more information regarding how the system interacts with the real world, such as how physics are counted. Rather than providing more assitance, it actually provides more rules, which I imagine most would take as optional. The profusion of tables and charts is a good indicator of the crunch involved here, the other coin face from an incredible inclusion of every possible solution. How would I like Jags to be improved? For that, I'll have to become picky beyond measure as it really is well put together system, so please take with a pinch of salt. The initial contents page is somewhat jarring by its size (see what I have to work with here?). Is it useful to have so many items there for quick reference? I would argue that only large headings should be in the contents at the front with detail included in an index at the back. Even for a book of 270 pages, a 7 page contents is only going to induce repetitive strain injury through scroll wheel use. Rather than jumping straight into the system, Jags first attempts to justify its own existence. I would prefer the same content to be rephrased as "This is why Jags is good for you!" rather than "Jags solved the problem of genericity and we think it's really good at it". Jags is bloody good, there's no need to justify it or generic systems at all! There is a change list, while useful is better kept on the website. Throughout, there are designer's notes which aren't really neccessary for learning the game system and although might be interesting to some, would be better placed on the website. Gamesmaster notes and hints should be placed in their own section so that the GM has a single place to pick up all of those nuggets. There are a few colloquialisms and non-standard roleplaying terms are used: Jags' resisted rolls are really opposed rolls. A common language for roleplaying is not really a requirement but reduces the effort a GM would have to pick up the game. The colour callout boxes do no print well on my HP 1010 laser as the contrast between colour and text is not high enough. The notes and important rules should just be part of the text in many cases as the page sometimes gets very crowded and the flow of the rules are difficult to follow. Rounded boxes everywhere! 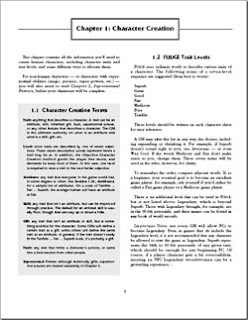 Character skills and traits are grouped together at the end of the character creation section but do not make them any easier to find by doing so. Much better to have them at the back of the book or leave them inline with the skill/trait description. I think Marco has pre-empted most of these comments by producing a cut-down 20 page Jags called Jags-2. I'll review that at some other juncture but it's a simpler form of the 270 page Jags-Revised. Jags has successfully taken the leap from free PDF to being free and a published book (definitely a good thing). Think of the PDF as try before you buy. There isn't much community to speak of at the moment, it appears that Marco is in the process of revamping the website after some villians hacked it so I will be keeping a beady and excited eye on that. There are four settings available: Wonderland, an intriguing moder day horror setting; The Thirteen Colonies (Marco and Eric Chacon) is set in an alternate near-future; and Have Not (Marco), a post-apocalyptic setting. No generic fantasy here, marvellous! It's a little out of the scope of this review to go into detail but they appear to be of similar quality. Is Jags free? You'll have to pinch yourself but it is. 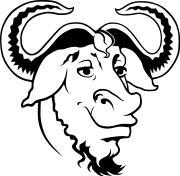 A fully featured PDF, with good content and excellent artwork in free format (GNU Free Document License). It appears to be the labour of love of Marco almost entirely and as long as he keep ploughing on, you can expect more excellent material. I am not convinced that the system is completely generic as the skills/traits bend away from fantasy or historical settings. I also wonder if 270 pages is a little too large for most gamers to get through. That's 270 without any setting. If you're looking for a crunchy (and I mean take-your-teeth-out crunchy) free system to base the setting that's been bimbling around inside your brain for a year or two, then check out Jags. There aren't any parallels. 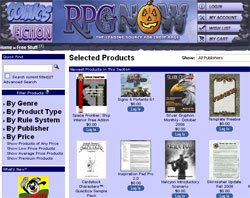 In this post I will be investigating the unavoidable truth that to play a roleplaying game, you need to print it and that is costly and a pain in the posterior. Find out how to get you favourite free gem in hardcopy without pawning the family heirlooms. For authors of freebies, I give some friendly advice to help you prepare your parephenalia for printing. Well done you. Before feeding page after page into the printer with joyous abandon, try setting the printer to print two game pages on a single sheet. You can do this through Print Properties (on Windows). Also, I'd recommend printing double sided. Do this by first printing odd pages, and then feed the result back into the printer to print the even numbered pages. If you want to go further, you could try only printing out those pages that have the crux of the rules, or the maps if it's an adventure. If begging a player to print it doesn't work and you don't have a gun or spare horse's head to convince them, you might find that there is a local 'business print shop' nearby. These places can print, bind and finish; for a fee. For the terminally lazy or home bound, you can get to them online. The same service is available for Brits and I have also used Staples. Personally, I don't like online print shops because you can't see what you're getting necessarily. I like to hold an example in my hand, even if it does mean travelling through beautiful British meterology, carbon footprint be damned. For the extravagant, there are online print-on-demand (POD) services. More on POD in the next section. Be careful when uploading something that isn't yours. I think most free game writers would not mind you using a POD service for printing for your own use but if you try and sell to others, that's likely to be not fair and probably illegal. After all, they've uploaded this thing for free, why should you be allowed to make money from it? Shame on you, filth! A perrennial piece of feedback I receive is that people love the fact a game is free but they can't be bothered to print it. It seems a shame to forever encarcerate your work. 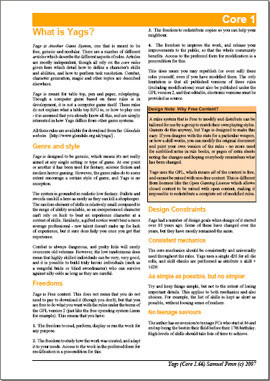 As a writer, there are some things that you can do to make your free game print friendly. I will raise my hand and admit that this list is generated mostly from mistakes I've made with Icar so if you feel a twinge of guilt reading this list, imagine the gushing horror I'm experiencing writing it. Cut the fluff. Wordy chatty nonsense that does not directly assist in the person playing the game or feeling the setting should be removed. Charming that the game was inspired by the sun glinting off a loved one's hair but it doesn't need to go in the book. Put that on the website where it is hosted as downloaders love backstory. The book has to be lean and mean. Remove any lengthy licences and link to a website, linking to a well know licence (such as Open Gaming License or Creative Commons). Remove pointless white space. When writing the book, you might have found it useful to structure it so that a chapter starts on a new page. In science writing, that is certainly advisable but in free RPGs, it's something of a luxury. Cutting white space can turn a 90 pages book into a 60 page one. Reduce font sizes and paragraph spacing. Your own personal taste is key here, make it as small as you can stomach. Once printed, it might look super small to you but then compare with other RPG books, you'll be very surprised. A cheap-as-chips (fries for our cousins across the pond) laser printer won't bleed too badly. One book. Printing eight PDFs is not as easy as printing one. Convert to PDF. PDF is great because Adobe has already worked out how to get your work to print on different page sizes. You don't need to shell out loads to convert it, either. Avoid colour. Colour printing is very expensive (especially in POD format) so avoid it if you can. Check your images, tables, graphs and so on that they look OK in black and white by printing yourself. Sorry if that sounds a bit like a confession, it's not intended so. Ironically, the easiest way to make your free game available to people is to upload it onto a Print On Demand service such as Lulu. Ridiculous though this might seem, it costs you nothing. If it feels odd that you are selling the free game you want to keep free then sell it 'at cost' such that you make no money from each sale and really the buyer is using Lulu as as an easy print service. Also, they probably already have the PDF so they should know what they are getting. Bridging the gap between the free net and the cash world is not easy but with careful print options and a little forethought from the author, the cost can be kept down. If someone thinks your free game is worth paying for, they will pay and you could well argue that it's their choice. Can you think of any alternatives? Have you printed many PDF books, free or paid for? What experience did you have? Any top tips to keep the cost down? Let's hear from you! 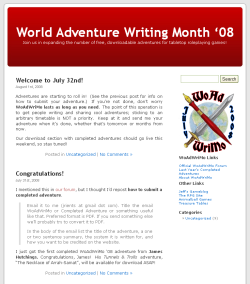 World Adventure Writing Month (WoAdWriMo) is an event each year that seeks to get people writing adventures to share online. The challenge is to write an adventure for your favourite game in a single month. Once complete, you upload your adventure document to the site and bask in the glory that is completion. The entries then displayed proudly for all to enjoy. In 2007, Jeff Rients was inspired by National Novel Writing Month (NaNoWriMo), where the aim is to write a 50,000 word novel in a month. I made it through NaNoWriMo in 2007 and it certainly was a challenge I was thrilled to see finished. No doubt the adventure writers in WoAdWriMo see it with the same trepidation and glee for finishing. The deadline for WoAdWriMo of one month is a soft one, so if you miss it by a bit and don't quite manage to get it in on time, Jeff (and the team?) will still accept. In 2007, June was the month and 2008 was July. Support for participents is good, lots of hints and tips about writing what you know, sticking to simplicity and just getting words down. Vaguely reminiscent of NaNoWriMo and understandably so (a WoAdWriMo blog post comparing the two perhaps, Jeff?) as they are both creation under pressure. 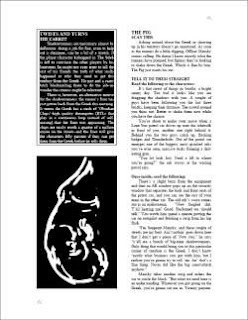 The output of WoAdWriMo is a series of free adventures in varying quality, consisting of a raw, hot-blooded gush of ideas in PDF/Word Doc form. That might sound like a criticism but the output (as reviewed below) benefits from the rough-and-brave thought-vomit you tend to get from creating under pressure. The documents themselves are well presented, there aren't as many graphics or maps as you might hope for but in all cases that loss is subliminally felt by the respective authors and replaced with rich narrative, passion and energy. At time of writing, only the 2007 entries were available, so I chose two very different ones to review. Zero Sum Gain is an adventure for Shadowrun 4th Edition by Bobby Derie. The adventure is based around the Shadowrunners being blackmailled by a woman who has had her own lover kidnapped. It's dark, gritty and of adult content. The 'good guys' aren't particularly nice and the whole adventure is cast in a sea of human social effluent. Although essentially linear, the adventure is arranged as a series of scenes such that a GM can chop and change. Each NPCs has enough motivation and backstory for successful ad libs. The final confrontation is likely to be a mix of tough decisions depedent on the players route through the scenario. The start of the adventure begins with the GM doing a one-on-one-roleplay with a character and although some players might resist being thrown into plot (as mine definitely would), Bobby does well to offer was around this. Each scene is well written, with tips on how to get around foreseen plot barricades while breaking up the familiar 2-column layout with pictures, some of which are impressionistic and take a little staring at before you see what they are. I must admit wishing I'd not been so clinical with some of my projects. Zero Sum Gain is repleat with resources for the GM: NPC stats and descriptions, maps and lots of feeling. With such a large amount of content it is difficult to believe it was written in a month. If you like gritty, hard hitting near-future adventures then download it. The adventure is generic enough to be run in any dark near-future setting. Great work, well done! The Blue mountains begins with the attractive strapline: "The Blue Mountains are your clan’s next home. It is your task to do a simple cleaning up before the clan can move in." which sums it up rather well. It is an adventure written for D&D 3e in the Frostburn setting of Conan and the Hyberian Age (by Robert E. Howard and others) that describes an alternative prehistory of Earth with ancient gods, palaces, tombs and so on. It takes the daring line of requiring the GM to know a fair amount beforehand, including the Frostburn setting and Norse mythology. I soon found that this was not entirely required but would allow a keen GM to turn it into a strong campaign. The scenario is peppered with optional new rules that dovetail into D&D 3e. These include new races and some new rules that diminish the power of magic as weilded by the players. The background is thin but Jay has taken the sneaky (and effective) move of adding hyperlinks to the Wikipedia articles on Norse, Pictish and Finnish mythos. A good when time is short. A quick blast through the different locations the characters will go adventurin' and the descriptive half is over. The rest of the document is set aside for maps and stat blocks, which is very welcome. It helps bring everything together. I would like a little more description and tie in to the setting but there are so many big ideas crammed into a small package (in a short amount of time), that it would take a considerable amount of time to fill out. We can only hope that Jay does as the setting is enthralling and the style of writing very easy. Nice one, Jay. WoAdWriMo is a great idea and superb source for free adventure material. It would be great to have all the WoAdWriMo material in one place, 2007 entries are on a defunct blog called Treasure Tables, there's also a blog and a main site (that looks like a blog) so it's a touch confusing. Perhaps a little graphic showing that a site is part of the WoAdWriMo network might help. Where the scenarios are list, it would help if there was a little more information. Perhaps a 'difficulty' grade hinting on whether it's a simple dungeon crawl or a more expansive plot idea. The text describing the scenario should read more like the back of the book. Thus, scope and tone of the adventure can be gleaned before downloading (especially important for adult oriented works like Zero Sum Gain). These aren't problems per se but would help pull the whole event together. Like most resources, WoAdWriMo has a nifty community forum, which rightly shows that there is a burst of activity around the event month and then tails off either side. It's good to see that people want to talk about their works as they work on them. The forum is relatively new (available only this year) but I think it will be a good solid feature for next year. An event that enthuses people (who do not ordinarily share their campaign material) to throw something onto the web for free is a great idea. It's a philanthropic challenge that should be applauded. If you're looking for a whole adventure or ideas to fit into you existing campaign, there is a wealth of ideas at WoAdWriMo. Well done to Jeff for bringing it about with such energy and congratulations to all the participants past and future. I wait with baited breath to read through the 2008 entries. 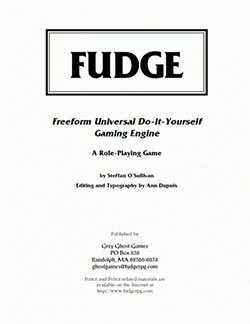 Fudge is a rules-lite generic roleplaying game system by Steffan O'Sullivan that was germinated around 1992 and became first released in 1995 with the requirement that it remained free. Fudge is now caretaken by Grey Ghost Publications (with Steffan's blessing) and the latest version is the 10th Anniversary Version (2005), which can be downloaded a attractively typeset 107 page PDF document. The PDF version is the one I will be reviewing, although I believe it's very close to the Steffan's original. If someone really has to begin play as a Legendary swordsman, strong man, etc., doing the GM’s laundry for half a year or so (in advance) should be sufficient bribe to be allowed to start at that level. The types of traits (such as Strength, Speed, etc) are decided by the setting in which you want to run but examples are given in the core rulebook. Typically, attributes are core characteristics and skills can be learnt. Gifts are special benefits and faults are the antithesis. Examples of different traits are included throughout, which helps both prospective GM and anyone trying to make their own setting. XP is called Fudge Points and is used as luck in game, modifying die rolls, succeeding in tasks, reducing wounding and so on. Characters are constructed using a points based system, which like any other, is open to abuse. These abuses can be solved with a well rounded setting and a common sense approach to GMing! All this is mentioned in the rules, rather than being assumed, which is good for the GM who is new to gaming. For hackneyed old GM stalwarts, we can nod our heads in sagely agreement. Supernormal powers account for Supers games as well as magic, psyonics and the like. Action resolution can be performed in a number of ways, depending on the dice you wish to use (or diceless). The different techniques are based on target numbers with the traits assisting your roll. Most of the outcomes are descriptive through adjectives and from this it gets it 'lite' moniker. Cynics would point out that the words really replace numbers and you end up doing simple mathematics anyway. Combat is performed in a similar way and damage is a simple series of wounds, you collect before you shuffle off the mortal coil. Throughout the rules are a smattering of black and white images. I would like the cover image given on the website (see above) to be the first page of the book itself but I would imagine that it's used for the printed version (more later). At the end of the book is a plethora of compiled hints, tips, a bestiary, example characters and more. There is also an example Magic System, Miracle System and Psyionic system. There is also a series of alternate rules included by a series of credited authors. A compilation of extras that is very impressive indeed. The Fudge book is very well put together. The writing is of a high level and explanations are well constructed. However, given the simplicity of the mechanics, 59 pages of explanation seems very excessive, especially as so much is required by add-on settings to specify. The separate dice mechanics are included to give more choice and to include a 'Fudge Dice' version that strives to be so different that it requires six sided dice with special faces. I think that it confuses the system to have so many different mechanics in a single book. It would be better to stick to one system and call that Fudge. The book sometimes refers to cultural specifics, such as "Groo the Wanderer". More mainstream examples of characters (Indiana Jones, for example) would be more useful for the new GM. GM tips are mixed in with the raw mechanics, which is not to my taste. I would prefer all over the GM hints and tips to be extracted and put at the back with all of the other hints tips. The humour is refreshing and often pokes fun at the gaming hobby, such as a spell use example for 'Create Pizza'. It makes the large book very easy to read. Well done to Ann Dupuis for doing an excellent typesetting job as well as keeping the game going. Free generic systems are impotent without a setting or two and there are many Fudge settings to choose from (far too many to choose from here). It's worth noting that most of the ones I could find need to be bought and are not free. There are free ones out there but they are not nearly as numerous. The range of settings is testament to the flexibility of the system. As Fudge has been around for more than a decade, it means that it has a large following. Online guides and a rather quiet community forum that is a good place to find settings and resources, most of them commercially available. There are so many resources online that they need aggregating, a sadly now defunct webzine called Fudge Factor did a good job of supporting and reviewing material but closed its doors in 2006. Fudge also spawned the free Fate system, which is a more story driven version, subject for another post. The community doubts its own activity but there are still those creating and updating. Fudge is large and popular, generic enough to handle just about anything. You can download the 10th Anniversary edition for free (107 pages) or buy the extended version (320 pages). The rules need boiling down and refining to reduce the size of the book and better compartmentalisation would be beneficial for the quick understanding of what is essentially a simple system. If you need a system for the setting you have been dreaming up then you could do much worse than Fudge. Its community spirit will only help in finding players. If you are looking to run a Fudge game, find the setting first and the rules will follow. Due to the pay-options for Fudge, it treads a fine line between free and commercial. If it can stay fresh and alive, then I'd imagine it will keep going for years to come. As a consumer, you might fit into one of two categories: those that think that free games should be produced to exactly the same standards as commercial ones and those that are content to accept a less polished product. I empathise with both camps. There is nothing more annoying than downloading a game and finding it part finished, poorly written or laid out like a chaos theory strange attractor. You have not paid for anything but you have spent time downloading, reading, investing emotionally and giving it the time of day. It's unsurprising you feel disappointed. So, what is reasonable to expect from a free RPG? I am going to attempt to outline those facets I want from a free RPG because it is different to what I demand from one exchanged for cold cash. As such, it's not particularly objective, so please feel free to give your ideas in the comments. NB: At this point, I am not talking about works in progress or ashcans (RPGs that are outlined to check feasibility) but those professing to be complete. Scenarios, settings, resources, tools and so on aren't really comparable here because they rarely boast 'completeness'. I'm going to split up RPG facets into groups: Need, Want, Nice to have. Need items are things that you really can't do without in an RPG. Any RPG, for that matter. Want are those things that I really want from a free RPG, aspects that make an RPG really worthwhile. Nice to have are just that. In the style of 'notes for authors', here are my Needs, Wants and Likes to have. So many free games in the past are simple HTML pages that do not print well. Google Documents can take your game and create a PDF from it. It makes all the difference. If you can make an HTML print well then go for it but dual columns tend not to work over many pags. A snappy title representing an important requirement. If a game is advertised as complete, then make it be that. A GM must be able to sit down and run a game from what is offered. Your readers are going to be suspicious of your game because philanthropy is rare, bump up the quality by good grammar and spelling. Typos can be avoided by spell checking and grammar by reading through carefully. Very few systems can stand up to purely design. Playtesting is not just about getting the mechanics tuned but also to see if the setting makes sense. If you have made a generic system, then you will need a setting before anyone will play it, so make one and play it. And play it again. How many fantasy games are there out there? Thousands and many sink without a trace. If a free game is offered for other people to read please make it new in some way. As it's free, you can be as creative as you like: Magic Bunnies in Rockets, Slaughter Nuns, The Journey to The Centre of My Nostrils, My Beard Is On Fire! So please do be creative. Two columns is a good start if you don't know what to do. The eye likes to read along short lines, so please consider two columns. Beyond that, any fancy text layout is is nice but do not lose any sleep over it. If you can find a kind artist to donate images in a fit of philanthropy or you fancy yourself as an arty type, then please splatter your rules with images. Do not worry if you cannot muster any up, the game can stand on its own. If you do have strong images with the game, more are likely to take it up as images can spark the imagination instantly and without effort, whereas text description requires more effort of the reader. Images are never missing from a free game. I suspect that there are more aspects a free game writer should consider when sharing their idea. Such is the danger of any list, it is never complete. Please do add your thoughts on items missing, or perhaps a different ordering. Do you feel that I've downgraded something important to you as a 'Want', when it should be a Need? Please do let me know. At heart, Yags is generic system based around a simple mechanic and lots of player options. There is a wealth of supporting documents and it is updated regularly by the driving force of Samuel Penn. The system is both familiar and elegant, roll D20 + (skill * attribute) then compare to a target number. Therefore, its weighted more towards the skills/attributes rather than the random roll (especially at higher skill levels). Attributes are at the core of a character's description are classed between 0 (no ability) through to 9+ (divine). They are split between eight primary attributes (which start at values of 2 to 5) and three secondary (that have no limits). For a generic system, the attributes are well chosen and general enough to fit most settings but are not so vague that your character is made from 'Stuff' and 'Thingy'. Skills are learnt through practise and training, you can gain more as the games goes along. Nothing ground breaking but the familiarity is a welcome comfort blanket to many. There are lots of examples of target numbers and the concept of degree of success (the more you're over the target, the better you succeed). The books are produced in HTML and PDF. They are identical as far as I can see but I prefer the layout of printed PDFs, so I will only review those. 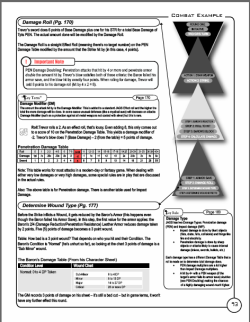 The Core PDFs are attractively produced two columns in three separate books (Core, Character Generation, Combat) . 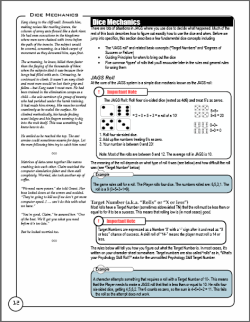 I'd rather all of the things you needed for Yags were in a single PDF: Download it. Print it. Run it. There are also separate files for Modern Character creation and the Character sheets (one for fantasy-esque, one for sci-fi). The Core books are colour coded (see Core rules right). It's not really needed but I like it. In the Core rules, Samuel describes his motivation for taking certain decisions in the game. Interesting as a writer and useful as a GM but perhaps best served either on the website or in a section at the back of the book. The Character book is well put together, there are lots of well described advantages, disadvantages and skills. Plenty here to build just about any character from any setting. Perhaps the skills could be cut back to allow sub-settings to define their own. If there is to be any crunch, it is in the sheer number of skills available. The combat system has a fair amount to it and I like the various options. I would like to see the more advanced rules obviously separated from the standard rules for the new GM but that's a minor complaint. It uses the same resolution mechanic as given above with different modifiers. There are examples for the more thorny areas and it would be nice to see some examples of a section of combat as a whole. There are pages that have only a little bit of information on it and then nothing else. It seems that each section starts on a new page, which isn't really necessary. Would be nice to remove the white space to save on home printing. I'm utterly guilty of this with Icar. Samuel has included the Gaming license at the back of the Core rules. As it stretches over 2 pages of legalese, it might be worth moving it as a link on the website (which there is) or as a footer in the PDF. The books are sadly bereft of images but I don't see that as a big problem. It might put some off but the game stands well without it. I'd make a cup of tea and take a seat before you plough into all of the additional material because there is enough to fill a library. 17 books (in PDF and HTML) covering a multitude of settings (modern, low mythic fantasy, sci fi), equipment and bestiaries and so on. 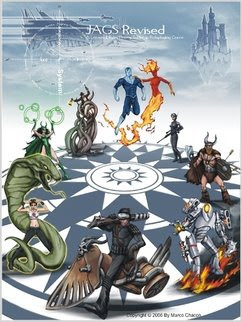 Group by setting type (fantasy, modern etc). There's enough content in each for a review by themselves. Oddly, there is no generic fantasy - something I rather like. The default setting for any free RPG tends to be a stock fantasy, so it's good that Samuel has steered clear of that. He notes that the system was created alongside Habisfern, the mythic low-fantasy setting. It has plenty of flavour to it and has the feel of something that ran as a campaign for many years. As a good example of the breadth of support, Samuel has also included a guide to making your own Yags books, which is both inspired and indicative of the game itself. The website can be a bit sporadic in its navigation but the dates of updates and news shows that Samuel is still working on the game (see right taken at time of writing). I'd like to see download pages consolidated and an easy 'get it here' link from every page. Minor niggles that might put some off but didn't make me want to tear off my own head. I can see that there is a redesign in process with white-and-blue pages being newer and green-and-white being older. Consolidation will soon wrap them all up. In conclusion, it's a well thought out system with a simple mechanic that is used throughout. The PDFs are well written, terms explained and rules laid out logically. The only support that is a bit tricky to fathom is whether it would run a good Supers campaign. I'd imagine so with the levels set the way they are but I've never run Supers, so I am somewhat ignorant. It's not really crunchy. There are a lot of options but they follow a similar mechanic, so your brain is unlikely to melt. I'd call the mechanics simple yet deep. Yags is polished, free and Samuel should be applauded for sharing!